Measuring the level of bulk solids presents a challenge, since providing just a level measurement does not necessarily represent the total quantity of product stored due to irregular surface of the bulk material. However, determining the exact volume is important for production management and related logistics processes, which can have a direct impact on the efficiency and profitability of a company. Calculating volume is often based on inaccurate estimates from single point measurements, or by complicated and slow manual methods. Such inaccuracies often lead to companies holding an unnecessarily high product reserve, or an underutilised storage capacity. The APM 3D scanner for bulk materials uses low frequency acoustic waves to make its measurement. The advantage of this is minimal attenuation in dusty environments. To obtain a three-dimensional map of the surface, the scanner uses the 3D phase radar principle, similar to that used in aviation. The map-points returning from the surface are refined using an advanced self-learning fuzzy logic algorithm, which is applied to dimensions of the silo to take into account the repo site angles. The acoustic bandwidth used is between 2,3 and 7 kHz. The energy attenuation created by dust is low in this band and therefore the measurement is practically immune to the dust. The acoustic signal sits within the audible band, however, the noise levels fall far below the set health and safety guidelines. The intensity of the noise prevents dust from settling on the inner surface of the waveguides, sensors and membranes. Thanks to the self-cleaning ability of the acoustic signal, dust does not build up in the active parts of the waveguides. Short acoustic pulses with different frequencies are alternately transmitted from three piezo sensors and the respective waveguides route them to the surface of the material. Irregularities in the surface of the bulk material create multiple reflections, which are then electronically processed. By using advanced filtration methods, the individual signal reflections are detected and converted into a map of the surface. The 3D scanner is capable of covering a wide surface area depending on the height at which it is located. To cover very large areas multiple scanners may be used. The correct location of individual scanners is important for accurate measurement, which is why installation and commissioning is supported by qualified APM specialists. 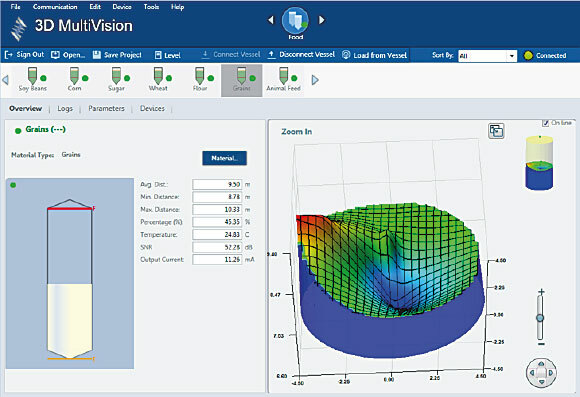 The APM 3DVision software provides data processing and visualisation. It provides general information about the quantities of products stored, but also a detailed view of the situation in an individual silo. The same software can also prepare reports of stocked materials at defined times. Detailed view of a silo with visualisation of the material surface. The 3D scanner technology is useful in all sectors of industry where there is a need to monitor the volume and status of bulk materials. The unit allows accurate measurement of virtually any bulk material with a density of 200 kg/m3 in silos up to 70 m high.